Ursula Huws is professor of international labor studies at the Working Lives Research Institute at London Metropolitan University and is director of the research consultancy Analytica. She is the author of The Making of a Cybertariat: Virtual Work in a Real World (Monthly Review Press, 2003). Faced with the difficulty of “placing” a stranger, the most common opening gambit is to ask, “What do you do?” Except perhaps in a few small hunter-gatherer tribes, a person’s occupation is one of the most important delineators of social identity. In many European cultures this is reflected in family names. People called Schmidt, Smith, Herrero, or Lefebvre, for instance, had ancestors who were iron workers. Wainwrights and Wagners are descended from wagon makers, and so on with the Mullers (Millers), Boulangers (Bakers), Guerreros (soldiers), and all the myriad Potters, Butchers, Carters, Coopers, Carpenters, Fishers, Shepherds, and Cooks whose names can be found in any North American phone book. Such discrete craft-based occupational identities began to break down under the impact of automation and the introduction of the factory system. Inherent in capitalist relations of production, according to Marxian theory, is the general tendency to reduce workers to an undifferentiated mass, who can easily replace each other—a working class or proletariat. There is a direct relationship between the degree of skill required to perform any given task and the scarcity of that skill and the ability of the workers who possess it to negotiate with employers (or, in the case of the self-employed, with customers) for high wages and decent working conditions. It is thus in the interests of capital to have a working class whose skills are as generic and substitutable as possible. Workers who have only generic skills are cheap to employ and can be got rid of if they become troublesome because substitutes can easily be found. For socialists, occupational identity (constructed as it generally is around the possession of particular skills, knowledge, or experience) thus presents something of a conundrum. On the one hand, it forms a basic organizational building block; on the other it is a barrier to the development of broader class consciousness. Traditionally most (though not all) organizations of workers have grown up around specific occupational identities in groupings which are simultaneously inclusive, in the sense that they generate strong internal solidarities, and exclusive, in the sense that they rely for their effectiveness on strong boundaries and restrictions on entry to the group. Some of the mechanisms for limiting entry to the occupation, such as apprenticeships, can be traced back to precapitalist forms of organization, such as guilds, whose members were often obliged to take oaths to preserve the secrets of the trade in elaborate initiation rituals and to engage in other practices which consolidated the bonds between members but excluded outsiders. Even much newer occupation-based groupings often exhibit strong social homogeneity in their membership, giving a gendered and ethnic character to who is admitted and who excluded. This gives them a divisive character in relation to working people as a larger class. However, through their strong organization and ability to resist being pushed around by the employers, such groups may play a progressive role in winning higher wages or improved conditions for some segments of the workforce or, more broadly, they may lead campaigns for protective legislation or welfare provisions which benefit the population in general. This has especially been the case in countries, such as Germany, where social-democratic political parties have taken the lead in developing sector-based, rather than occupation-based collective bargaining. Although the welfare states that developed during the post–Second World War period in advanced capitalist countries took distinctive forms, all of them undoubtedly owe many of their achievements to the efforts of workers’ organizations that were strong enough to compel employers to share some of the productivity gains of mass production. As a result, employers and states agreed to a kind of compromise in which they lessened their antagonism to workers’ organizations and labor allowed employers to manage workplaces without constant threat of disruption.2 Workers’ organizations did differ in different countries; they were either explicitly occupation-based, as in the craft-based trade unions that were prevalent in the United Kingdom, or based in more general trade unions led by labor elites with strong occupational identities.3 It should be noted, however, that this same period was also characterized by labor markets which were strongly segmented by gender and ethnicity, as well as being fractured along many other dimensions. Skill does not just have a double-edged character for labor; it has an equally ambiguous meaning for capital. The innovation process which forms the necessary motor of change for capitalist development is deeply contradictory in its need for skill. Before a task can be automated, it is necessary to draw on the expertise and experience of someone who knows exactly how to do it to anatomize every step in the process and work out how it can be standardized and how a machine can be programmed to repeat these steps. Once expropriated, the knowledge and experience (or “craft”) of these workers can be dispensed with, and cheaper, less-skilled workers can be substituted to operate the new machines. Arguments about whether the development of an ever more technologically complex capitalism results in deskilling or reskilling are therefore beside the point. The nature of innovation is such that both processes happen simultaneously: each new development in the technical division of labor entails a new split between “head” and “hands.” In order to routinize the jobs of one group of workers, another, generally smaller, group with some sort of overview of the process is necessary. As workers resist or adapt to change and organize to protect their interests, new occupations are continuously being formed and older ones re-formed. Just as occupational identities can be said to be both exclusionary and inclusive, they can also be said to be in a continuous process of construction and deconstruction. Employers have to balance their interest in cheapening the value of labor with their need to ensure that there is a renewable supply of well-educated and creative workers with fresh new ideas. In some situations, they also want to retain proprietary control over skills and knowledge that give them a competitive edge over rival companies. It can be argued that traditional Marxian theory underestimates the importance of skill in shaping the ways in which labor markets function. The reality that has evolved is considerably more complex than the classic picture of a polarization of society between a bourgeoisie—that owns the means of production, controls the circulation of goods and capital, and dictates the functioning of the state—and an ever-more homogenous proletarian mass, whose members can be kept in line by the knowledge that any worker who demands too much can be replaced by someone else from the “reserve army” of the unemployed who can do the same work more cheaply or more compliantly. On the contrary, the evolution of an ever-more complex technical division of labor has created a constantly changing demand for an extremely diverse range of skills, many of which are specific to particular stages of industrial development, particular sectors, proprietory processes, products, or even specific companies. However, despite this multiplication of tasks in a division of labor which is increasingly dispersed both contractually and geographically, the concept of the reserve army is still a relevant one that helps us make sense of many recent developments in labor markets, in this era in which the labor-employer-state compromise (sometimes described as the “Fordist deal”) has either collapsed or is under severe strain. But in order to tease out these understandings, we need a more differentiated idea of the role played by occupational identities and skill in the functioning of labor markets. We also need to look more closely at the role played by the state in providing generic skills to a workforce which is required to fill niches in an increasingly complex and turbulent economy and the role these generic skills play in eroding occupational boundaries and undermining the power of organized labor. A starting point for this analysis is the idea of a labor market itself. There are of course many ways in which the very concept of a market in labor is questionable. There is an extreme asymmetry between the characteristics of labor and those of capital which make the trade in labor quite different from trade in other goods and services. The human body, the basic unit which is offered on a labor market, has finite limits in terms of its strength, endurance, and agility, as well as in the number of consecutive hours it can keep going, which are different in character from the employing company’s resources, which can be stretched as far as the limits of its access to capital and raw materials. Labor is not physically mobile in the way that capital is, and, in this era of free trade when capital can cross national borders at will, labor is strongly constrained in its ability to tap into opportunities in other countries. It is often easier for your body parts to cross a national frontier after you are dead than it is for you as a living person to enter that country legally to seek work. Labor markets are also distorted by many other factors including monopolies and monopsonies (a single buyer of labor power), cartels, various forms of alliance among businesses or labor, state intervention, and other constraints on the availability of time or mobility (such as the need to carry out unpaid reproductive work) which reinforce gendered and racial divisions in the workforce. A market in which certain jobs are only available to men, or to white people, or to people of a certain religion, cannot by any means be characterized as a “free” market. The most important factor of all, however, in limiting access to jobs and preventing the development of “pure” competition in the market may be employers’ needs for workers with specific skills in a highly complex—and increasingly global—technical division of labor. One of the most important attempts to retheorize labor markets was Peter Doeringer and Michael Piore’s groundbreaking book, Internal Labor Markets and Manpower Analysis (Lexington Books, 1971), in which they developed the idea of dual labor markets. In this model, jobs fall roughly into two categories: those in “primary” or “internal” labor markets and those in “secondary” or “external” labor markets. Internal labor markets, they argued, are insulated from external market forces by internal rule systems. Employers who need particular skills, tuned to their own specific working practices, are prepared to offer inducements to keep loyal workers, including higher wages, pensions, holidays, and a range of other fringe benefits. Internal markets, they went on to say, are typically highly structured and hierarchical, with internal advancement paths, relying heavily on firm-specific knowledge. In these internal markets, employers are prepared to invest substantially in in-company training in order to achieve high levels of productivity. In other words, the levels of wages and conditions are different from those which would pertain in a “pure” external market. Entry points into these internal labor markets are hard to squeeze through, but once inside workers enjoy a number of benefits. In secondary or external labor markets the unspoken deal between capital and labor is very different: employers do not make a long-term commitment to the workforce but are prepared to accept lower levels of commitment and productivity from workers whom they feel free to lay off at will. Typical workers in internal labor markets at the end of the 1960s when Doeringer and Piore were writing would have been civil servants, or employees of large companies such as IBM or General Motors; typical workers in external labor markets would have been janitors or waiters, or self-employed people who offered their skills to a range of different customers. It soon became clear that this dual model was too simple to explain the complexity of wage differentials across whole diverse economies. Doeringer and Piore’s insights were elaborated by other analysts, to develop models of multiple or segmented labor markets.6 The concept of segmented labor markets recognizes that there may be numerous different labor markets in which wages and conditions are shaped by an interplay of factors including national education systems, industrial structures, cultural traditions, labor protection legislation, and the ways in which workers are organized. In retrospect, we can see that the internal labor markets described by Doeringer and Piore and their followers were not absolute and unchanging features of the economic landscape. Rather, we may perceive them as specific to a certain phase of capitalism, namely, the period of postwar compromise. Although the death of this period is often proclaimed, we cannot be certain that elements of it will not continue to be useful or even necessary for capitalism in the future. However, it is reasonable to conclude that it is past its heyday. In order to understand how and why it has collapsed it is perhaps useful to look in a little more detail at how it functioned in its golden era. First, it is necessary to emphasize that the special deal struck by capital with its essential “core” workers inside large organizations only functioned effectively because it did not cover all workers. Although there were historical moments when labor aristocracies used their power to win broad gains for much larger portions of the working class, the lucky insiders were kept aware of their privileged status and, on the whole, kept in order by the knowledge that life out there in the secondary labor market could be harsh. Patterns of inclusion and exclusion were often reinforced by ethnic and gender differences. Second, it is important to remember that the postwar model was not universal, but took different forms in different countries, shaped by their particular industrial structures and histories, including the specific ways that workers’ organizations had evolved. In Germany, for instance, a strong social-democratic movement pushed for sector-level collective bargaining agreements which meant that the “insider deal” was extended to all workers in a particular sector, rather than just to certain occupational groups (as was common where craft-based unions were strong, for instance in Britain) or in certain companies (as was the case where company-level bargaining was dominant). David Coates has provided us with an extensive analysis of the economy-wide implications of such differences which have produced distinctive types of welfare systems, patterns of investment, degrees and types of government intervention, and particular training and qualification systems which are in turn reflected in the ways occupations are defined.6 Various types of “insider deal” are also complemented by specific types of “outsider deal,” and this in turn means that the collapse of the postwar compromise takes a unique form in each country. In order to try to model some of these differences, I use a diagram adapted from Rosemary Crompton (see below) to integrate dual labor market theory with gender and class theory.7 I have found this diagram useful for analyzing the differences between labor markets in different countries, and particularly for examining how they change in times of rapid structural and technological change, such as the one we are living through right now. This diagram takes internal and external labor markets as two extremes, shown here on the right and the left of the diagram (allowing for the possibility that there may be other intermediate types of labor market segments placed somewhere between these extremes). It then adds another dimension, that of skill, shown here on the top and bottom of the diagram. It should in principle be possible to plot any kind of paid work somewhere in relation to these two axes. For instance a highly paid executive of a large company or a senior civil servant would be somewhere near the top on the right-hand side, near corner B. But a highly paid freelance accountant working for a number of different clients, although still near the top in terms of skill level, would be over to the left near corner A. Down at the bottom on the right-hand side, near corner D, would be a new recruit or an apprentice at the bottom of the occupational ladder in a large stable institution (e.g., a trainee mail sorter). Over on the bottom left, near corner C, would be a seasonal fruit-picker or a part-time, temporary burger-flipper. Again, there are many intermediate skill positions. In a country like Germany, with its corporatist politics, historically strong internal labor markets, considerable employer investment in training and tightly-defined occupational demarcations, and a welfare system closely linked to employer-based plans, we would expect a high proportion of the working population to be grouped towards the right-hand side of this diagram. A typical career trajectory would be to start down in corner D and work one’s way up toward B, by taking the training courses provided by the employer and following the internal company rules. In a more “liberal” labor market, such as that of the United States or the United Kingdom, the characteristic pattern would place a much higher proportion of the working population over on the left-hand side of the diagram—working contingently as self-employed individuals, or as temporary or part-time workers with little long-term job security and few chances for promotion within the firm or training beyond the immediate requirements of their job. Typically, the qualifications that workers do hold, beyond basic high school certification, have been acquired at their own expense or that of their parents. These labor markets could be expected to exhibit a stronger polarization, with major differences in living standards between a large undifferentiated mass of precarious workers near the C corner and the privileged few near A or B and considerable variation in between. These are not, of course, the only two possible models. We might expect the Scandinavian countries with their strong welfare systems linked more to citizenship than to employment status and their commitment to publicly provided education and training, to have highly skilled working populations much more skewed to the top half of the diagram, with relatively few in either C or D. Many developing countries, in contrast, would be likely to have a very small formal sector, meaning that the great mass of the population is over on the left-hand side of the diagram in A or C.
Despite fairness rules, in all these types of labor market, opportunities would not in practice be available equally to the entire population. Life-long resident (and white) men would usually dominate the B quadrant of the diagram, with immigrants, people of color, and women more likely to be found down in the C quadrant. 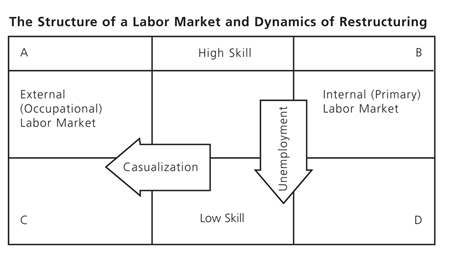 This diagram is not just useful as a way of comparing static labor markets. It also helps us understand the different dynamic ways in which organizational restructuring affects workers in different national contexts. The employers’ incentives to reduce the cost of labor may be the same wherever they are based, but in a “corporatist” labor market, where employees are protected by strong union agreements, the boundaries of the internal labor market are firmly defined: either you are in or you are out. Just as the most usual way in is through formalized appointment procedures, so too the way out is likely to be through a formalized redundancy process. Workers who are inside the internal labor market have a lot to lose, since most of their welfare benefits are linked to their employment status, so they will fiercely resist expulsion and will often accept a radical restructuring of their work (e.g., through accepting a breakdown of traditional job demarcations known as “multiskilling”) rather than lose their toehold inside. Once unemployed, they find it difficult to find another job, partly because their skills may be very industry specific or employer specific and partly because employers are reluctant to create new jobs for people to whom they will have to make a long-term commitment. The route out of secure well-paid work is thus likely to follow the direction of the arrow I have marked “unemployment” in the diagram. In a less regulated labor market such as the United States and United Kingdom, internal labor markets are much less well-protected, and the benefits of being inside them are often relatively less. Here, employers are much more likely to respond to changing circumstances by casualizing employment. Increasing numbers of temporary workers are taken on to replace or supplement the work of full-time employees; staff with skills that are still required but not regularly are encouraged to go part-time, or go freelance; and increasing use is made of outsourcing. The way out of the internal labor market is thus more likely to follow the direction of the arrow I have labeled “casualization” in the diagram. Although unemployment still exists in these countries (just as casualization takes place in countries like France, Germany, Austria, and Belgium) it is less likely to be absolute or of long duration. Instead what can be seen is a general worsening of working conditions and growing insecurity, as a creeping precariousness spreads across the labor market like rust eating away at the old Fordist machinery. Do these differences matter? Readers of the business press will no doubt be used to finger-pointing articles blaming the five million unemployed in Germany on the “sclerotic” or “rigid” European labor market policies just as readers of more liberal European journals will be familiar with stories about the overworked workers of the “Anglo-Saxon” countries who have given away their rights in a collective act of self-exploitation. Such perceptions do little to foster a sense of unity among workers. But traditional Marxists might argue that the great mass of the unemployed and the great mass of contingent workers nevertheless serve more or less the same function: they are the reserve army whose existence acts as a brake on workers’ movements to improve pay and conditions in the more organized segments of the labor market. There is only one problem with this approach. Modern economies now produce such a huge array of goods and services, involving such a wide range of different inputs in such complex configurations that for many tasks (though not all) simple muscle power is no longer enough. In other words, the technical division of labor has evolved to a point where most jobs actually require specific skills and a reserve army is no use unless it possesses them. These are not, however, in most cases the same skills that were required a generation ago—those skills around which the occupational identities of the second half of the twentieth century evolved. The jobs of the lathe turner, the linotype operator, the pattern cutter, the graphic designer, the film editor, the proofreader, the keypunch operator, the audio typist, the switchboard operator have all either gone the way of the handloom weaver or the scribe or been transformed out of all recognition. A key role in this transformation has been played by information technology. The use of computers has not ironed out the many differences that remain between different production processes, industries, and companies. However, it has introduced a range of standard processes for organizing and manipulating the information pertaining to them. The proportion of the workforce that actually uses a computer in the course of its daily work varies from country to country but it is high, and growing. And employers do not want to have to bargain with a small elite group of workers who understand how these computers work and are able to operate them (as some of them had to in the 1960s when computer programming was the exclusive—and mystified—preserve of a few relatively privileged techies). Neither do they want to invest heavily in training them. What they need is a plentiful supply of computer-literate workers who can be taken on when they are needed and dropped when they are no longer required, with no fear of being left stranded without the necessary skills when demand picks up again. But how can they guarantee such a supply? There is an interesting parallel here with what happened in the nineteenth century when the organization of industry and of national economies and empires became complex enough to require a workforce that was numerate and literate. Not only was an army of clerks necessary to process the invoices and receipts for all the transactions involved in international trade, there was also an increasing need for records to be kept of the work itself to note who had worked what hours and calculate their earnings. It was also useful even for manual workers to be able to read, write, and do simple arithmetic so that they could follow instructions, keep track of stock, and so on. If only a few people had these skills, that would have given them some bargaining power which would have restricted the employers’ scope for maneuver. It was also, of course, necessary to ensure that new recruits arrived at the workplace already instilled with the values of punctuality, hard work, and respect for other people’s property. Literacy and numeracy were also useful to people in their capacities as consumers—so that they could handle cash in an economy that increasingly relied on money, read public signs, and identify which goods to buy. What was the solution? Universal primary school education, teaching the “three Rs” in an atmosphere where authority was to be respected, a strong work ethic was encouraged, and truancy or lapses in punctuality were punished severely. Once these skills were universal, nobody could exert extra leverage in the market by possessing them. Nowadays, both the rhetoric and the skills are a little different. Employers want people who are “digitally literate,” “self-motivated,” and “good team players” and who possess “soft skills,” “employability,” and “entrepreneurship.” They also require people who are prepared to keep on learning new skills as the technology or the market changes, sometimes described as “a commitment to lifelong learning.” And they need people who are familiar with or able to master a range of specific software packages and who can communicate with distant customers in a global market. Needless to say, these “skills,” “competences,” “aptitudes,” and “know-how,” combined in whatever pick-and-mix permutations, do not add up to stable occupational identities. In fact, they imply a world in which there are no limits, in the sense of “this is what I do; but this is what I don’t do as part of my job,” where each job description is infinitely elastic and there is never a point at which the worker can sit back and think, “At last, I’m trained. I have a recognized occupation. Now I can relax and just get on with the job.” But there is convincing evidence that we have now entered a phase of global capitalism where, just like the need for universal literacy in the nineteenth century, there is now a universal need for new generic attitudes and abilities. And, just as in the nineteenth century, state agencies have leaped to the assistance of the employers to provide them. Only this time it isn’t within national borders, or competing empires, but on a global scale. It is never easy to disentangle capitalism’s need to expand in order to find new markets from its need to tap into new sources of labor. Indeed, the two are intimately interconnected. However it is hard to deny that the current educational policies of supranational bodies like the World Bank and the European Union, as well as those of the individual nations that are recipients of their aid, have, if not as an explicit aim, at least the effect of creating a global reserve army of “knowledge workers.” In the process, any market advantages held by those who previously had more or less exclusive access to this knowledge are destroyed. At a national level, these attempts take different forms in different developed countries. For instance in Austria, in keeping with the corporatist model, the government has set up arbeitsstiftungen, labor foundations, which provide training for unemployed people in close cooperation with local employers. In one study by Hans Georg Zilian, in the district of Leoben, it was found that 38 percent of the trainees ended their spell of unemployment by returning to their former employers. Zilian concluded that these foundations act as holding tanks for the employers, where workers can be retrained at the taxpayer’s expense until they are needed again.8 In relation to our diagram, such activity can be seen as taking place near the D corner, with the state colluding with employers to co-regulate entry to what, though heavily eroded, could still be regarded as an internal labor market. In less regulated economies, training may be more likely to be carried out at the expense and initiative of the individual, and it can be conceptualized as taking place over on the left-hand side of the diagram, among the casualized workers who make up the A–C axis. In some cases the subsidy from the state to the employer may be less direct than simply paying for the training. Regardless of the precise role of the state, there is in general more and more emphasis in job advertisements as well as in training courses on the need for “e-skills” and “digital literacy.” Across the European Union, the European Computer Driving License (ECDL) certifies that its owner has acquired basic computer skills. Such programs often explicitly demand a dismantling of national qualification systems and links to international courses and curricula, including the franchising of courses run by universities and colleges in donor countries, the compulsory teaching of English in primary schools, and, sometimes, a second European language in secondary schools, as well as the now familiar emphasis on “e-skills,” “digital literacy,” “employability,” and “entrepreneurship.” Multinational companies are also active in establishing global skill standards, for instance by providing certification courses in the use of proprietary software, like Microsoft or SAP, or donating hardware or telecommunications to schools and colleges to familiarize students with their products. In the EU, under a series of “eEurope Action Plans,” various targets for achieving general levels of computer science attainment, alongside other “knowledge society” indicators, such as levels of Internet access and usage of e-commerce, were set for the ten new member states that joined the EU in 2005, as well as for Romania, Bulgaria, and Turkey, which are still waiting in the queue to join. The new member states in Central and Eastern Europe, including Hungary, the Czech Republic, Poland, Slovenia, Slovakia, Lithuania, Latvia, and Estonia, are already taking on the role of a cheap back office for the rest of the EU.12 The “third countries” referred to in this policy document constitute an outer ring of countries beyond these: Albania, Bosnia and Herzegovina, Croatia, the Federal Republic of Yugoslavia, the Former Yugoslav Republic of Macedonia, Armenia, Azerbaijan, Belarus, Georgia, Kazakhistan, Kyrgyzstan, Moldova, the Russian Federation, Tajikistan, Turkmenistan, Ukraine, Uzbekistan, Mongolia, Algeria, Egypt, Israel, Jordan, Lebanon. Morocco, Syria, Tunisia, and Palestine. As these programs are rolled out, the populations of these countries can increasingly be set alongside those of established offshoring destinations such as India, the Philippines, or Barbados for the English-speaking world, Tunisia, Morocco, or Martinique for French speakers, or the Dominican Republic, Mexico, or Colombia for Spanish-speakers in the global race to the bottom for information workers. With high-capacity telecommunications infrastructure in place, and workers who speak the global languages and can use the increasingly standard global software packages, it will be possible to switch work seamlessly from worker to worker and place to place in the process which is increasingly known as “global sourcing”—a complicated mixing and matching of tasks from a number of different locations in specific configurations to suit a particular business client. It is often assumed by workers in the developed economies that the point of moving work offshore is to eliminate the jobs back home. But this is to miss the point. The purpose of a reserve army is not to take over all the work but to act as a disciplinary force. The actual number of jobs being relocated overseas is tiny compared with the normal “churn” in national labor markets. National employers still need skilled workers in their home territory, near to where their clients are based, and most are reluctant to offshore their more sensitive “core” research and development work. And in any case, many of the sectors in which offshoring is taking place, such as call centers, are still expanding. Companies also, of course, need a home market for their goods, something which would not exist if there were mass unemployment there. The U.S. market is still many times larger than, for instance, that in China or India. While not denying the real misery caused by the unemployment which is certainly taking place, it is nevertheless important to remember that the most powerful effect of offshoring is not to eliminate jobs in the United States or in Europe, it is to cheapen them. If workers know that the skills they have are also held by hundreds of thousands of other people around the world, then it is very difficult to organize on the basis of their unique occupational identities. And if they are aware that it would be perfectly feasible, technologically speaking, to move their jobs offshore, then this creates a potent disincentive to ask for improvements in wages and conditions or to refuse to take on extra tasks. Just the possibility that the job might move is enough to destroy their security and workers’ bargaining power. While their employers still need creativity and knowledge and, often, highly specialized skills, these are less and less likely to be found within fixed and stable occupational identities. In the destruction of these identities, are we witnessing the final death of the postwar high-wage, high-consumption deal and with it the end of job security? Or are we simply living through yet another twist in the development of capitalism? Will we see a collapse of organized labor into protectionism and racism, or will workers’ ingenuity and ability to adapt and respond to new challenges lead to the development of new forms of organizing across national frontiers? And, when in the future people ask us, “What do you do?” what will we reply? ↩ Gøsta Esping-Anderson, The Three Worlds of Welfare Capitalism (Cambridge: Polity Press, 1990). ↩ I am indebted to Markus Promberger (e-mail correspondence, May 31, 2005) for pointing out the historical importance of occupationally defined elites in the German trade union movement. ↩ For a more detailed explication of the commodification process see Ursula Huws, The Making of a Cybertariat: Virtual Work in a Real World (New York: Monthly Review Press, 2003). ↩ Jill Rubery & Frank Wilkinson, Labour Market Structure, Industrial Organisation and Low Pay (Cambridge: Cambridge University Press, 1982). ↩ David Coates, Models of Capitalism: Growth and Stagnation in the Modern Era (Cambridge: Polity Press, 2000). ↩ Adapted from Rosemary Crompton & Kay Sanderson, Gendered Jobs and Social Change (London: Unwin Hyman, 1990). ↩ Hans Georg Zilian, “Welfare and employment flexibility within the new labour market,” paper presented at Labour and Welfare in Europe in the Information Economy: Is there a danger of digital divide? Workshop, LAW Project, March 1, 2005, Brussels. ↩ I am indebted to Yigit Kargin for bringing this to my attention. ↩ Ursula Huws, Jörg Flecker, & Simone Dahlmann, Outsourcing of ICT and Related Services in the EU, European Monitoring Centre for Change, European Foundation for the Improvement of Living and Working Conditions, Dublin, December, 2004.